The musical journey of singer/songwriter and worship leader Terah Lynn began at a very young age. Long before she was old enough to understand the intricacies of how music worked, she was mesmerized by its power. She began writing songs at the tender age of 5, little knowing it would eventually be one of her greatest passions. Through her teen years, though Terah had given her life wholeheartedly to God, she often struggled with deep questions and doubts as her awareness of the world grew, and it was then she discovered the therapeutic effect that playing piano and writing songs had on her. After earning her bachelor’s degree in music composition, Terah Lynn’s life changed dramatically when she married her husband, and later had children. In 2011, after taking several years to focus on raising her family and leading worship at her local church, Terah completed her first album, In Simplicity, at the request of her mom, who was battling cancer during that time. Terah’s mom has since recovered, but says she still loves the quietness this album brings her every time she listens to it. In 2014, Terah was excited to find that God was opening the door to new things. She became the producer and host of Sounding The Light, a podcast where she interviewed and promoted other diverse Christian artists and their music. Through this ministry Terah had the opportunity to be a regular guest co-host on south Atlanta-based radio station 90.7/91.7 NewLife FM, sharing music and STL interview highlights on the NewMornings show, until she and her family moved to Oregon in the summer of 2016. 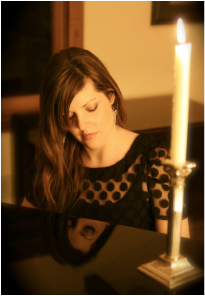 Terah Lynn has written and produced two more albums since In Simplicity, solidifying her keyboard-driven "indie pop/classical" music style. The first, a 6-song EP titled Beauty In Broken Down Places, was released in April of 2015. The second, In The Time Of Christmas, is a full-length album of traditional and original Christmas songs which released in December of 2016. Terah Lynn’s songs have been played on TV and radio, as well as in musicals performed onstage. Several of her pieces have also been performed in Spivey Hall, one of the premier music venues of the Southeast.